First I posted a Moss Stitch Shawl Pattern, then I posted a Moss Stitch in a Square Pattern, and I got lots of comments about how to use this same stitch but in a rectangle. Well here it is! Moss Stitch in a Rectangle using Caron Big Cakes Yarn! You get a lot of bang for your buck with this yarn. With just two balls, it makes a fairly good size blanket and I love all of the different variegated color combos available. The colors will naturally makes these stripes! 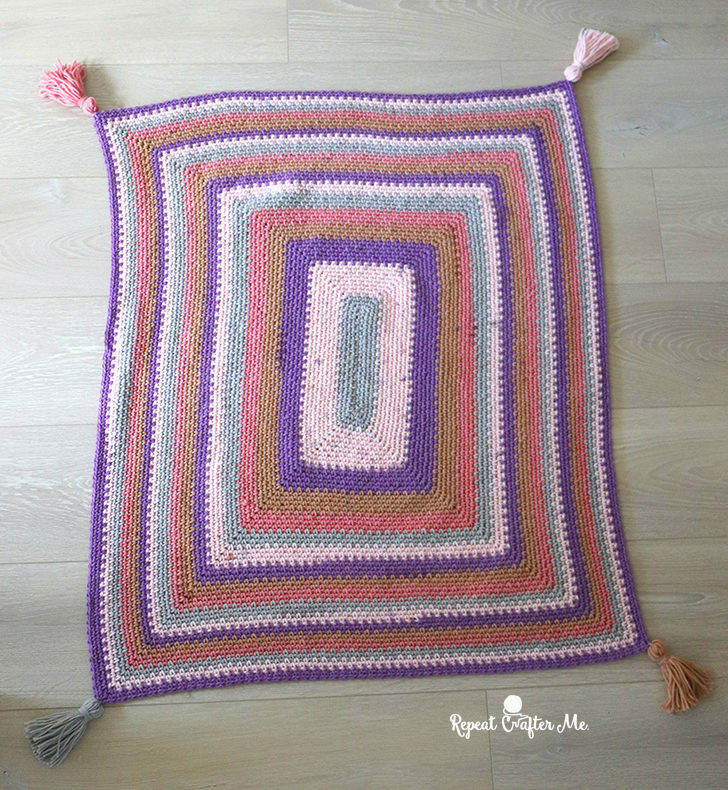 Just keep crocheting in rounds and see the yarn work its magic! Chain 28, SC in the 4th chain from hook + chain 1, *skip a stitch, SC + chain 1 in next chain, repeat from * all the way down chain. When you get to the last chain make a SC + chain 2 + SC all in one chain. SC + chain 2 + SC all in the first stitch, chain 1, skip a stitch, SC + chain 1 in next, skip a stitch, SC + chain 1 in next, repeat from * all the way down chain, until you get to the last chain, SC + chain 2 + SC in last chain. Do not join. Round 3 – 60: Continue to repeat pattern by SC + chain 2 + SC in all the corners and SC + chain 1 in all the chains from the previous round. Continue pattern working in continuous rounds until it’s as large as you’d like! When you are ready to fasten off, you will want to end in a corner. Slip stitch to join your yarn in any corner. Fasten off and weave in ends! Add tassels to all 4 corners for a little extra flair! Here is a video tutorial to help clear up any confusion! Someone mentioned using it as a placemat! Love this idea! If I wanted to make a blanket how many big cake should I buy. Would want about 40 by 60? The pattern of towels you share is very beautiful. Many colors are very prominent. you are very skillful.